Call me crazy but I just recently started boiling chicken! I don’t like to bake chicken because it really dries it out so for the last few years we have been grilling it or using the crockpot. I have been amazed at how good it is boiled – it stays very juicy and is easier than baking or grilling it! Since I have found a new way that I love chicken I wanted to share it with you! You can eat it plain or use this in your favorite chicken recipe! P.S. We’ve been making this in the Instant Pot lately! Try it! 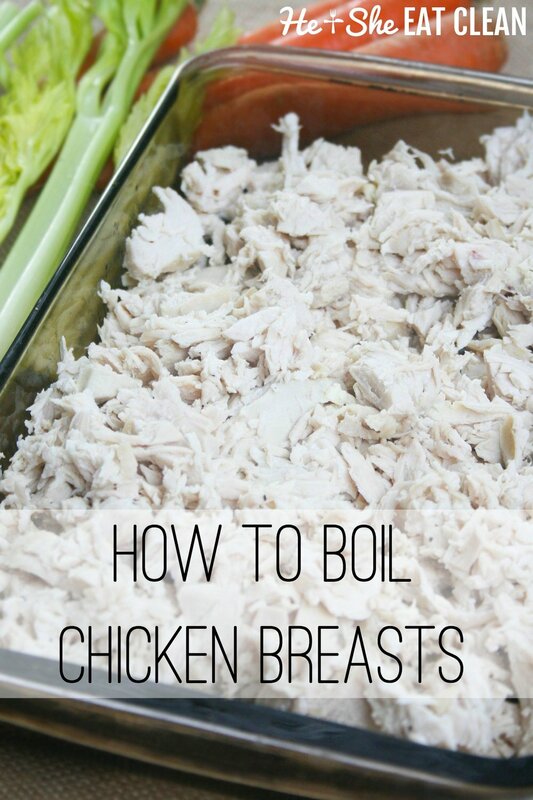 Not sure what to use your boiled chicken for? We’ve been using this method for a few of our most popular recipes! Try our Clean Eating Chicken Salad, Savory Chicken Casserole, and/or our Chicken Tortilla Casserole using boiled chicken. They are very simple meals to prepare and great for leftovers! Place chicken in a large pot and cover with chicken broth and water (I usually do a mixture of both). Be sure to cover all chicken. Add your desired spices (I usually add 2 Tbsp minced garlic for 6 chicken breasts and just sprinkle sea salt and pepper) and vegetables (I’ve used carrots, celery, onions, etc…clean out your fridge!). Once boiling, reduce heat to low and cover. Allow chicken to cook until heated through (this usually takes 25-30 minutes for 6 chicken breasts and 8-15 minutes for 3 breasts, depending on the size). Always check the temperature with a meat thermometer. He and She Tip: We love making ours with just minced garlic, sea salt, and pepper. Then each time we eat it we can season it however we want. It’s even really good with mustard! Below are the nutrition facts for boneless, skinless chicken breasts. It’s actually 160…if you get to 165 it’s dried out. I recently began to love boiled chicken, too. I always grill or oven bake but decided to boil it one time to make Chicken Divan, which is was perfect for . What is the point of a recipe for 3 chicken breasts? So then.. why do they sell chicken breast in packs of 3? I’m not the correct person to ask that question. You can boil as much or as little chicken as you want though. I can’t stop laughing…”You can boil as much or as little chicken as you want”…is my new answer to any nonsensical complaint. What is the proportion of chicken broth to water that you recommend? Half and half, or something else? I’m single, and never use more than 3. I definitely appreciate it! Ha, yes! Thanks for taking the time to comment! My family is small, two adults and a toddler. I’m thankful for the cooking time of 3 breasts, as this is all my family needs prepared for our meal. I don’t understand why people always have to comment or critique things that don’t apply to them, but might apply to others. I’m so glad it was helpful Abraham! Thanks for taking the time to comment. Great recipe, easy and clearly written. I always have chicken broth, but for some unknown reason I usually boil chicken in water. What a difference the broth makes! Thanks for taking the time to post this, great job! It does make a big difference in flavor. Thanks for taking the time to comment! Hello there! Just stumbled across your post/site as I’m in the middle of batch cooking for my 11 month old and was looking for a boiled chicken recipe; thinking this will fit the bill! I’m doing garlic & rosmary and opted to omit the salt. Thanks! I’ll make sure to check out the rest of your site! Hi Rachel! Thanks for taking the time to comment. We would love for you to check out the rest of the website. 🙂 Garlic and rosemary sound delicious! Hi Nora, we also love to use ours for chicken salad! Im either going to use vegetable broth or garlic broth, ill add tomatoes and some frozen veggies and some rice when I make this. If you choose breasts with rib meat, you won’t need to use chicken broth, because the fat will render as it’s boiling. Add salt to taste, and voila! 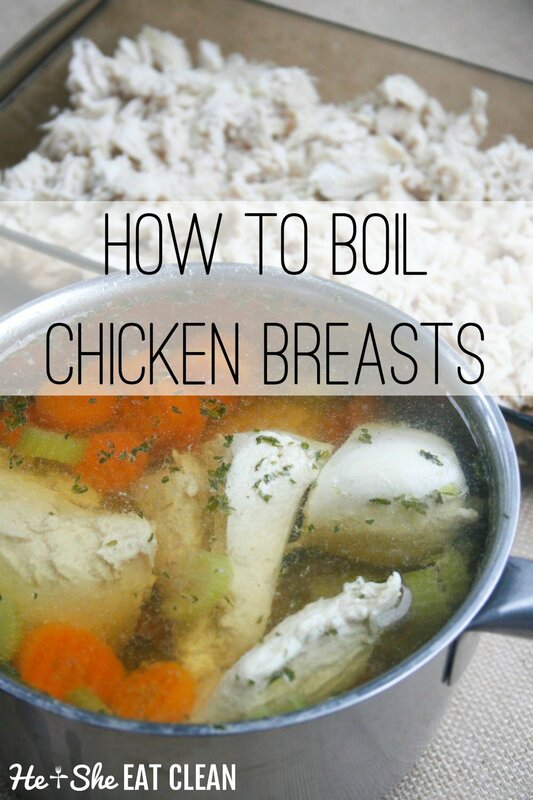 You have also made your own chicken broth to use in another recipe. Thanks for the instructions, Whitney! My favorite lunch meal is a bowl of diced up chicken breast, cubed avocado, roasted garlic cloves, and a small handful of pistachios. (I season it all with a little cayenne and sea salt.) I’m tired of firing up the grill, though…this will make things so much easier! Any idea how many days they’ll keep in the fridge? I appreciate the advice, I felt silly type in how to boil chicken. Because honestly I have never done it before so your article was very helpful thank you and it turned out just delicious! Like Sandi, as I typed in “how long to boil chicken” it felt like it was something I ought to know – and that everyone else already did. It’s comforting to see that I wasn’t the only one in the dark :). You are definitely not alone, Terry. 🙂 I’m glad you found what you were looking for and found us! Let us know if you ever have any questions. Great post. Was looking for an easy explanation and yours was great. One question, if I don’t have a meat thermometer, how will I know if the chicken is done? Can I just cut it and see if its still red? I’m glad it was helpful Nele! If you don’t have a meat thermometer you can certainly cut into it (cut into the thickest part) and see if it is still red or too pink in the middle. Also, once it’s finished it should be very easy to pull with your hands or forks. I hope this helps! Thanks so much! Had the time to look through some of your other material now and found it super helpful. Stay wonderful! Does the chicken cut up into cubes or does it just shred? I prefer cubes so I’m looking for an easier way than baking. Hi Janice! You can certainly cut it up into cubes instead of shredding. I also use cubes for some recipes.